Dharambir Singh is one of the most prominent Sitar player and Indian Music educator based in England. Disciple of the legendary Sitar maestro Ustad Vilayat Khan, Dharambir has truly imbibed the sound of the rich Imdad Khani and Vilayat Khani Gharana (style). Before becoming a disciple of Ustad Vilayat Khan he was fortunate to have his initial guidance from Professor Sita Ram of Amritsar in Punjab, India. He then moved on to be introduced to the Gayaki (vocalised) style of Sitar playing by Professor Narinder Nirula of Patiala in Punjab. 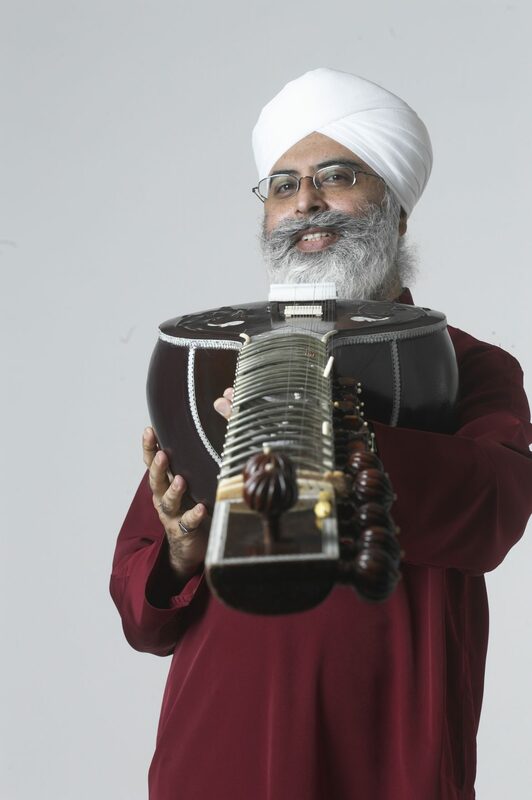 Prof Narinder Nirula is one of the prominent student of Ustad Vilayat Khan and has a unique style of playing the Sitar with a strong Punjabi cultural influence. Dharambir was guided by his uncle Sardar Avtar Singh, an eminent tabla player and disciple of Harbhajan Lal and Pandit Shamta Prashad of Benares. Avtar Singh was instrumental in introducing Dharambir to many prominent musicians and also giving him initial musical guidance. It was the blessings and the love of Satguru Jagjit Singh, the spiritual master of the Namdhari Sikh sect that Dharambir was introduced to Ustad Vilayat Khan. Satguru Ji has been one of the most important catalysts to have given Dharambir a strong spiritual persona and karma. Ustad Vilayat Khan Saheb generously provided access to the rich musical style of the Imdad Khani Gharana. Dharambir got immense love and guidance from the Ustad and as a result of his dedication and the blessings of the masters he was invited for Ganda Bandhan (traditional initiation ceremony) in Bombay in 1979. Dharambir moved to England in 1979 and has since been active in his portfolio career performing, teaching, advising, organising, mentoring, composing and passionately laying a strong foundation for Indian classical music in England. He did his graduation in India and after moving to England studied for his MA at the School Of Oriental and African studies at the University of London. He also got his FTCL from Trinity College London in performance. He is very analytical and the combinations of his academic profess and performance skill has given him an open mindedness and an unending desire to learn from all spheres of life. Dharambir has traveled widely and performed in major festivals in England, Spain, Germany and Italy. He has also performed in Canada and USA. He has worked extensively with the Euro Asian Fusion group Shiva Nova. He performs regularly in collaboration with musicians from other musical styles. His work with the eminent Bitish saxophonist Martin Speake resulted in a well acclaimed CD “Journey”. His work with the Free Spirits Jazz ensemble was awarded by the Jazz Uk. Dharambir’s reputation as an educator is un paralleled in England. He started teaching for the Leicester Music service in 1983. He was employed by the Leeds College Of Music as a lecturer and the Artistic Director for Leeds Centre For Indian Music and Dance. The Leeds appointment gave him immense opportunity to train South Asian and Non Asian musicians. He acquired a niche to teach Jazz musicians and as a result produced some prominent musicians who perform North Indian Music on Western Instruments. He has initiated numerous innovative projects across the country and is well known for the International Summer Schools in Indian Music. He has many students of Sitar all over the country and makes regular trips to other cities to teach. Dharambir Singh was the artistic director of SAA-uk a leading arts organisation based in Leeds from 1997 till 2005. Dharambir Singh was the founder and the artistic director of SAMYo the first national south Asian music youth orchestra and artistic adviser for Tarang, UK’s first South Asian senior ensemble. He worked closely with Sampad and Milapfest the leading promoters in UK in sowing the seeds for these two very significant ensembles and youth music development initiatives. He has played a major part in the Shruti Arts, Leicester, Nottingham Asian Arts Council, Darbar festival, has been on various panels of the Arts Council and was a board member of Arts Council Yorkshire. Dharambir Singh was an adviser for Bharatiya Vidaya Bhavan, London, the centre for excellence for the Indian Cultural studies in the country. He advised on the BMus (Hons) Indian Music at the Bhavan, taught in collaboration with Trinity College Of Music; and has been instrumental in writing the course document for the degree. He was also module leader and taught on the degree. Dharambir Singh received the National Endowment For Science Technology and the Arts (NESTA) fellowship from 2006 to 2010. He has researched into many aspects of Indian Classical Music and has created valuable technology solutions for the teaching of Indian Music. The fellowship has given him extraordinary insights into Indian Music and he has created some pioneering concepts in trying to make the music more accessible to the students and the audiences. His developed software will help to place the rich heritage of Indian Classical Music on a strong scientific footing. He has traveled regularly to India to introduce and get feedback on his new approaches to music teaching. Dharambir recieved MBE in the year 2011.